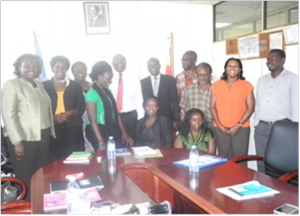 Uganda National Health Users’/Consumers’ Organisation(UNHCO) with the tobacco control advocates is close to achieving the fruit of its labor on the advocacy on the tobacco control bill. Uganda’s Ministry of Finance, Planning and Economic Development has finally issued a Certificate of Financial Implications for the Tobacco Control Bill, 2014. The Certificate issued on Friday February 14, was handed over to the mover of the motion, to table the TC Bill, Hon. Chris Baryomunsi. The issuing of the Certificate now paves way for the tabling of the Bill, which according to Hon. Baryomunsi, should be in a month’s time. The certificate of financial implications is a pre-requisite for the tabling of any bill moved by a private member, like the tobacco control bill. All the other requirements, including the consultations with the Tobacco Industry and the tobacco farmers were already fulfilled. The Certificate is therefore a great achievement in the Uganda Tobacco Control Bill process and a great step towards the attainment of a comprehensive legislation. UNHCO’s commitment to tobacco control advocacy is derived from the core value of the organizations priorities which is the right to health. Tobacco products are the only legal consumer products that kill people when used as intended by the manufacturer and unlike other consumer products there are no safe ways of using tobacco products. Uganda is a tobacco growing country where about 15% of male adults and 3% of female adults between 15 and 49 years and 15% male youth and 14% female youth currently use tobacco products (UDHS 2011). 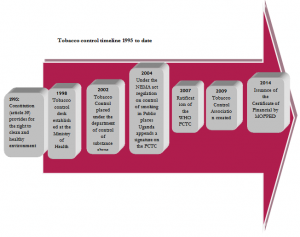 Uganda has been involved in curbing the tobacco epidemic since 1998. While the main causes of death remain the communicable diseases, it was noted that additionally the burden of non-communicable diseases particularly heart diseases, Chronic Obstructive Pulmonary Disease (COPD), stroke and cancer was on the rise in the population. Knowing that tobacco is an underlying risk factor for non-communicable diseases, some efforts were introduced in the country in order to reduce the use of tobacco and tackle its serious consequences. Tobacco control is a cost-effective primary prevention intervention for countries at any stage of development. It was in 1998 when the MOH established a Tobacco Control Desk as the coordinating unit for tobacco control, but it was only in 2002 that a Tobacco Control Focal Point was designated at the Ministry of Health (MOH). The tobacco control efforts have intensified over time culminating in the establishment of the Environmental Regulations – Control of Smoking in Public Places Regulations in 2004, a milestone in counteracting the epidemic. Despite the strong lobby by the tobacco industry, the country successfully ratified the WHO FCTC in 2007.